I love fresh cranberries with their vibrant color and their tart and bitter flavor. They pair beautifully with sour-sweet fruits like raspberries and cherries, as well as citrus fruits like kumquats and mandarins. While I’m not one to shy away from cranberry compotes and sauces, I prefer cranberry relish for its freshness and for that wonderful hit of subtle bitterness that’s lost when cranberries are cooked. This relish, which combines cranberries with sour-sweet mandarin oranges, apple juice and a hit of whole, unrefined cane sugar, is one of my favorites and finds a place on my Thanksgiving table each year. Cranberries, like other berries, are particularly rich in antioxidants which help to detoxify free radicals that can accumulate in the body from diet, the environment or from the body’s own internal metabolism. They are particularly rich in vitamin C, quercetin, anthocyanins and flavonoids, and its these micronutrients that give cranberries not only their vivid color but they’re remarkable and potent flavor. Cranberries can reduce oxidative stress, and help to enhance heart health as well as health overall (1). Vibrant in color and packed with flavor, this classic Cranberry Relish is a delight to have on the Thanksgiving table. Rinse and pick over the cranberries, discarding any bruised or mushy fruit. Chop the mandarins coarsely, including the rind, but discarding the seeds. Combine all ingredients in your food processor and process until it forms a slightly coarse relish. Chill and serve. You can make this relish up to 3 days in advance. You can culture it! You can culture this relish to make a naturally fermented cranberry relish full of beneficial bacteria. Replace the apple juice with kombucha, and leave out the sugar. Seal the relish in a tight jar (like this one) up to 3 days. Transfer it to a mixing bowl, stir in the sugar, and serve. 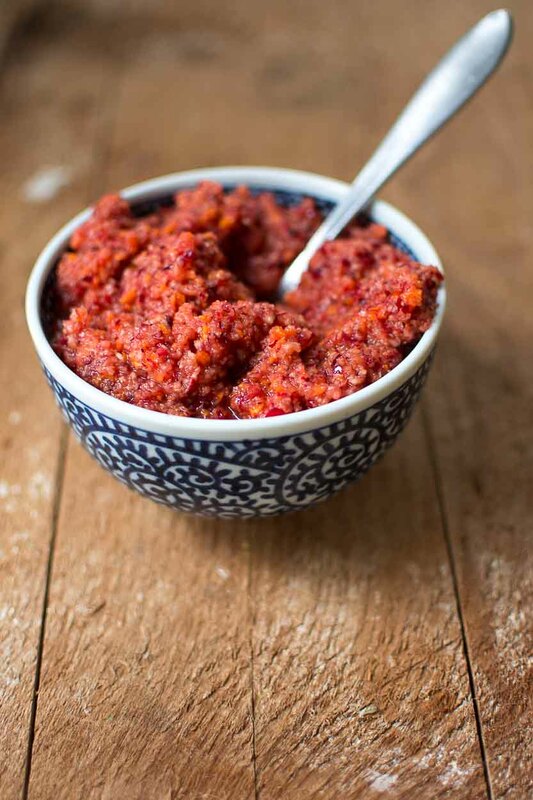 This recipe for Cranberry and Mandarin Relish comes from the Nourished Kitchen Guide to Thanksgiving. The guide includes a cookbook with over 40 Thanksgiving recipes, as well as 4 menus complete with shopping lists and a game plan to get dinner on the table on time as well as a mix-and-match Thanksgiving planner to help you create your own menu. And there’s plenty of options for gluten- and dairy-free guests, menus for feeding a crowd as well as preparing a smaller and more intimate gathering. The guide, recipes and menus are available for download here. Too often cranberries are brought to the Thanksgiving table like a relic and then forgotten for the rest of the year. Instead, consider serving them throughout the year. Cranberries are available fresh in October and November, and are available frozen year-round. Cranberry Mors is a traditional Russian drink made by simmering cranberries with honey. We like to serve it warm with a hit of sweet spices. Cranberry Kombucha Slushies are a super refreshing treat with a bright, tart flavor. Cranberry Kumquat Sauce is another favorite for the Thanksgiving table if you don’t care for relish. I love this uncooked cranberry relish, it is so good. I make it too, but my recipe doesn’t include apple juice. I will try it with this time, thanks!! Your recipe looks so bright and refreshing. This recipe looks sumptuous. I can’t wait to try it. Thanks! I wonder, can you put jars of cranberry/mandrain in boiling water bath to seal lids in order to keep them for awhile? My mom makes this every Thanksgiving, and now that I have my own family, I do too. I’m so excited to see it here! We’ve never used mandarins. We usually only have navels or valencias. My mom’s recipe is just: one whole orange, one bag of cranberries, and enough sugar to make it taste good. I’ll try adding the apple juice this year. My grandma makes a similar relish, with a few differences- first it has a staggering amount of sugar in it (white sugar, of course). And she adds apple to it. I may marry the two (your less and better sugar, her apple) and see what I get. Do you think you could do this as a fermented recipe? Yes, I too wondered if you could make it as a fermented product! Also, in its current form, I guess the shelf/refrigerated life is only a couple of days? How far ahead could I make it ahead? Today for tomorrow afternoon? For sure. It’ll last about 5 days in the fridge. I’m making mine ahead today for tomorrow. When you say, including the “rind” – do you mean the entire peel? Or jus the pulp? 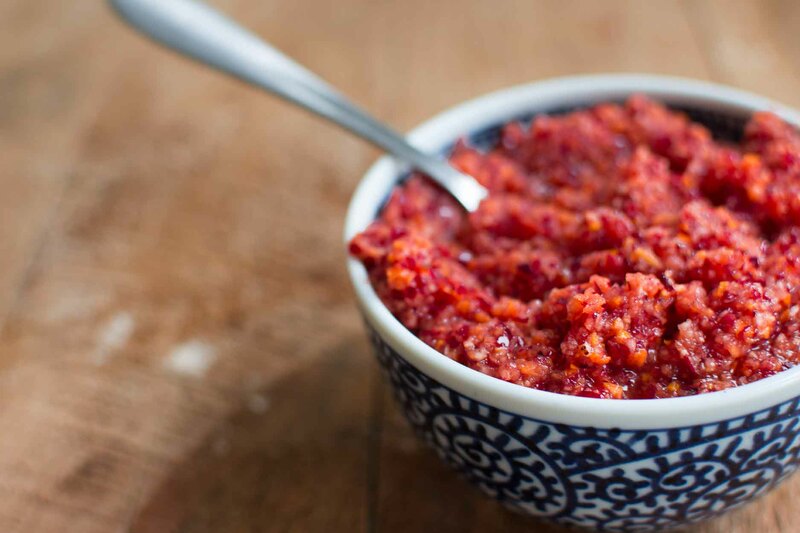 This cranberry relish is AMAZING! Thank you for sharing it. I read this recipe the other day and had never heard of Satsuma Mandarins. I then went to Whole Foods a couple of days after reading the recipe, and wouldn’t you know that WF had the Satsuma Mandarins. God has an amazing way of bringing new foods into my life. I will read a recipe with a new food I have never heard of, and then go to Whole Foods, and that food will be in the store. This happens to me on a regular basis. Pretty cool. Just a thought: can you do an article on the difference between apple juice and apple cider. Chatting with an apple grower the other day, as we were picking apples and asked what does he do with all the slightly bruised/on the ground apples. They go for apple juice. Got the “yuck” factor here. Can you make apple cider from apple juice? As every WAPF writer talks of ACV all the time, maybe it would be nice to have it out there. Thanks. Yum! What a clever way to use cranberries!